Afterburner & USAA will deliver the free Military Transition Seminar for the fourth time this year, delivering career planning guidance for successful transition. On July 21, Afterburner will deliver the fourth installment of the 2015 USAA-sponsored Military Transition Seminar (MTS) schedule. The day-long program is a career planning seminar for exiting service members and their spouses, and is open to all ranks and branches. Developed and delivered by veteran-owned-and-operated management training and consulting firm Afterburner Inc®, the MTS is a key veteran initiative for both Afterburner and corporate sponsor, USAA, and provides training in critical career development areas. The seminar will be held from 7 a.m. to 5:30 p.m. Tuesday, July 21 at Club Stewart in Fort Stewart, GA. 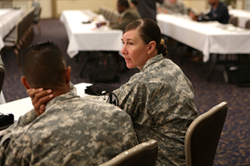 The full-day seminar is part of a larger initiative to encourage military members to think more strategically about their transition to civilian life well in advance of their separation or retirement dates. The course curriculum trains veterans to identify key areas of consideration and to use those as guidance throughout the planning process. Participants develop career planning strategies, learn job search skills, networking, interview preparation and how to incorporate all facets of their support network. Most important, veterans are shown the importance of developing a lifetime civilian career as opposed to securing an initial job. The planning process used in the Military Transition Seminar is the same process Afterburner deploys to top corporations, providing each participant with an individual career plan, complete with a personal value proposition, career objectives customized to his or her previous experience, and insight into industries where military core competencies are in high demand. As part of the seminar, each participant will also receive a copy of “Down Range,” the recently released veteran career transition guide co-authored by Afterburner founder and CEO Jim “Murph” Murphy and retired Navy Cmdr. Will Duke, Afterburner’s director of Learning and Development. Written from the firm’s nearly 20-year history working with Fortune 500 and Global 2000 clients, “Down Range” empowers exiting military members to communicate the value of their service experience and individual areas of expertise, and to use those skill sets and experience as catalysts to success throughout their civilian careers. In founding Afterburner, Murphy developed a team of veterans whose military training, experiences and skills are in high demand among global corporations. Director of Embed, Afterburner Inc.
Afterburner Inc. was founded in 1996 by U.S. Air Force fighter pilot Jim “Murph” Murphy and trains organizations around the world in the simple, scalable improvement processes of Flawless Execution. Afterburner brings elite military precision to top corporations around the world. With a client list that includes over 35 percent of the U.S. Fortune 500, Afterburner has ranked on the Inc. 500/5000 List of America’s Fastest Growing Companies four times and has been featured in leading publications like The Wall Street Journal, Businessweek, Financial Times, Newsweek, Slate, Sports Illustrated and the Atlanta Business Chronicle. Afterburner also has appeared on CNN, ABC, CNBC, Fox News, HLN and Bloomberg News, among others. To learn more about Afterburner’s innovative approach to building elite teams and Flawless Execution, visit http://www.Afterburner.com or call (888) 982-6764.